Female shaman Jun Mi Sun expressed her fondness to Kim Soo Hyun. 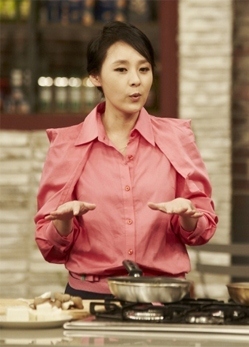 In the Olive cable channel’s Olive Show broadcast on March 20th, 2012, Jun Mi Sun said, “Very wanted to make delicious cuisine for Kim Soo Hyun,” expressing her feelings of liking for Kim Soo Hyun. Jun Mi Sun who played the role of female shaman in The Moon that Embraces the Sun was full of praise for Kim Soo Hyun, and their senior-junior friendship also making a lot of people envy.